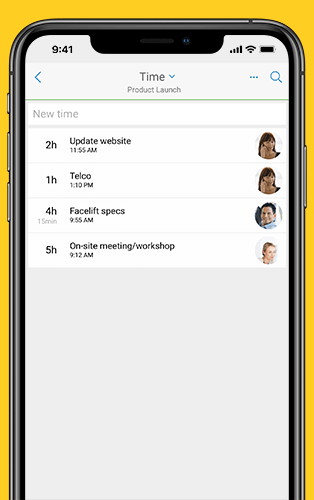 Projects, tasks, documents, time tracking: Now you can manage your projects on the go - with InLoox Mobile App for iOS and Android. Here’s what you can do with our mobile app. Nowadays we can do a lot on just one device - the smartphone - for which we previously needed several devices: watching TV, listening to the radio, sending emails, taking photos and videos, setting your alarm, and so on and so forth. So it’s not far-fetched that sooner or later we’ll also be planning and controlling projects with our phones. 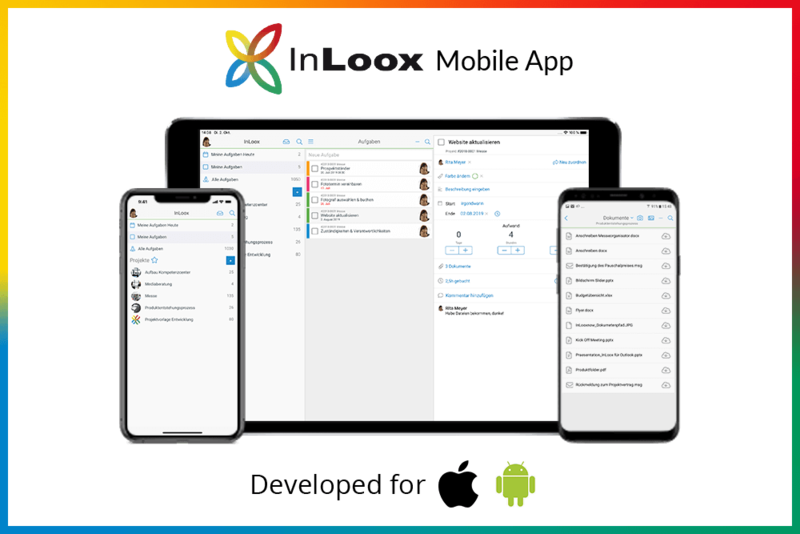 InLoox users could already work on the go with InLoox Web App, but InLoox 10 offers users a new possibility: native apps for iOS and Android devices. Here’s what’s new: You can use InLoox without an internet connection. This means that you can continue working offline in InLoox even if the WIFI in the coffee shop you’re in is weak or if your monthly mobile data is nearing its end. As soon as you have a connection again, InLoox synchronizes your project data automatically - across all devices and clients. Tasks, projects, everything - this also applies to the InLoox Mobile App. Users have full access to their projects and tasks. They can upload documents and assign tasks, as well as track their project times and book them to project tasks. Keep track of all your personal and project-related tasks. Create tasks directly in InLoox Mobile App and immediately assign the task to a project. You can also delegate a task by assigning another team member to that task. 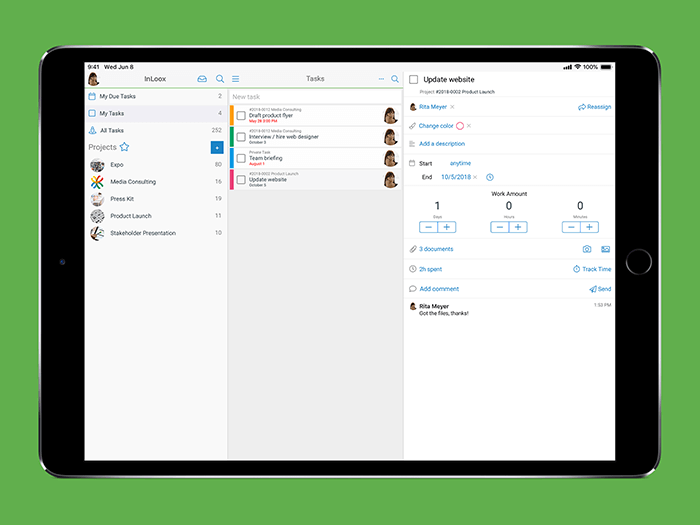 Don't miss any task updates thanks to the comment feature. You can also mark tasks as complete as soon as you've completed them. That’s a quick way for sales representatives, for example, to report the task status back to the project manager who’s at the headquarters. You can filter the project list by favorites and display only the projects that are most important to you. Or if a new project was decided in your weekly department meeting, you can create the project directly in InLoox Mobile App and add team members to the project. Using the burndown chart and the overview of completed and open tasks, you can easily track the progress of the project while on the go. You can send documents from other apps to InLoox, you can save them directly to the project or link them to a project task. You can also take a photo with your smartphone and link it to a task. This enables you to have a complete documentation in your projects, e.g. to document minor flaws on the object in your construction project that need to be fixed. "How long did it take to complete that task again?" - If you haven't looked at the clock at the start and end of doing that task, then you will most likely have to estimate the effort at when you have to report your times. It is easier if you book your times directly and save them in InLoox. You can book times on a project, but also directly on certain project tasks. Important: You need an InLoox now! account or an InLoox PM Enterprise license with Universal User to use InLoox Mobile App. 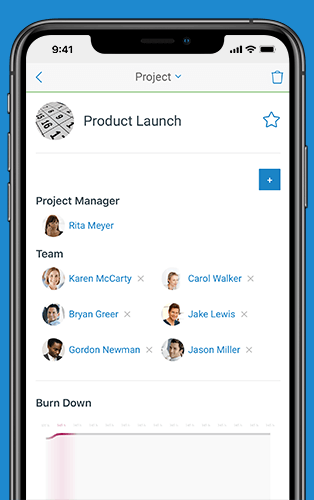 Mobile Project Management: InLoox Mobile App for iOS and Android - InLoox • Copyright 1999-2019 © InLoox, Inc. All rights reserved.